In demonstration of their commitment to literacy and a brighter next generation, Clearwater residents, including dignitaries, business leaders, students and their families turned out in force for the opening of the Applied Scholastics Community Learning Center. More than one thousand members of the Greater Clearwater community crowded North Fort Harrison Avenue to applaud the re-dedication of the remodeled Applied Scholastics Community Learning Center. Established in 1998, this center has provided tutoring to thousands of children in the Greater Clearwater Area. The falling of the bright blue ribbon, signaling the re-dedication of the center, brought the gathered dignitaries, neighbors, community leaders, students and their families, to their feet. The new center on Clearwater’s Fort Harrison Avenue reflects the continued commitment by Scientologists to the Greater Clearwater Community. The grand opening ceremony commenced with a spirited rendition of “Lean on Me” performed by a combined choir of Clearwater students. Applied Scholastics Community Learning Center Executives and honored guest speakers pulled the ribbon to re-dedicate the newly transformed facility. It marked a new era for education and literacy in the Greater Clearwater area. Following the ceremony, attendees streamed in to witness the remodeled center for themselves. Materials on display in the Community Learning Center’s Course Room gave guests the opportunity to preview Learning How to Learn, a Study Technology book based on the works of L. Ron Hubbard, as well as other materials available to students at the Center. These materials help students advance an average of one grade level in reading per 30 hours of instruction. The Community Learning Center Park provided shady spots for guests attending the event. The Center’s new basketball court was a popular stop for kids on their tour of the center. The new Applied Scholastics Community Learning Center is a welcome beacon for area children and their families. Having provided help to the community for nearly 20 years, the Center is empowering a second generation to increase their literacy and love of education. Narconon Suncoast, just 10 minutes from downtown, is part of a growing roster of centers using the remarkable drug rehab technology developed by L. Ron Hubbard. The Center stands as a valuable asset for residents in the Greater Tampa Bay community. The Criminon Florida headquarters presents a central point for carrying out the mission of addressing the causes of criminality and restoring offenders’ self-respect through effective character-building programs. Currently over 1,000 prisoners in Florida are enrolled on Criminon programs improving their chances of re-integrating into society as productive citizens. The Clearwater office of The Way to Happiness, dedicated to the nonreligious moral code written by L. Ron Hubbard, provides common-sense morality to communities throughout Tampa Bay. In one Pinellas County community alone, since volunteers began a campaign to educate residents with The Way to Happiness, the crime rate dropped 56%. The Clearwater center for the Foundation for a Drug-Free World—an international drug education initiative which has reached 260 million people worldwide—has created partnerships with dozens of law enforcement agencies and more than 100 youth education facilities around Florida. The home for United for Human Rights and Youth for Human Rights in Clearwater, presents global education initiatives which identify and protect the rights of every citizen of the world. All told, the center has partnered with 130 like-minded groups and organizations to bring effective education on human rights to young and old alike throughout the State of Florida. Citizens Commission on Human Rights (CCHR) Clearwater is the local operations center for the world’s leading mental health watchdog group since 1969. The information center features the Psychiatry: An Industry of Death museum, and serves as an investigative arm and referral center dedicated to the eradication of psychiatric abuse. Here’s part of the problem: 85 percent of the juveniles in the criminal justice court system are functionally illiterate. About 70 percent of prison inmates cannot read above a 4th grade level. Two-thirds of young people who can’t attain 4th grade reading levels will end up in jail cells or on welfare. And here’s another dimension to the problem: 32 million American adults can’t read—14 percent of the population. On April 16, part of the solution arrived in Clearwater, Florida, with the opening of a completely remodeled Applied Scholastics Community Learning Center. The more than one thousand people who attended the ceremony were there for one reason—to fight illiteracy and its offspring, poverty and crime. The newly transformed center on Clearwater’s Fort Harrison Avenue just minutes from the downtown core reflects the continued commitment by Scientologists to the Greater Clearwater Community. Indeed, the opening comes at a crucial time for students. In Pinellas County, for example, only 78 percent of students graduate high school. “We are proud to be opening this Center in order to bring a workable study technology to all children and families in this community,” said Pat Harney, hostess for the event, and Director of Public Affairs for the Church of Scientology in Clearwater, before introducing the first speaker of the day, Community Learning Center Executive Director Holly Haggerty. Haggerty’s message was echoed in the words of guest speaker Judge Linda Babb, Florida’s 6th Judicial Circuit Court, who sees the effects of illiteracy firsthand in her courtroom: “An education is the foundation one needs in order to build a successful life,” said Babb during the ceremony. “However, when a foundation isn’t properly laid, it won’t support the rest of the structure. When a teacher fails, a student doesn’t learn and their life crumbles just a little. A Detention Deputy for the Pinellas County Sheriff and long-term community activist, Schenique Harris, related the story of how she brought her son to the center for help—National Football League cornerback Leonard Johnson. “Praying for a miracle, the kid who could barely read saw a sign that read: ‘Free Tutoring.’ Our pathway towards happiness began that day at the Community Learning Center! Haggerty is very excited about what the future holds for the students who will be crossing the Center’s threshold. The Community Learning Center offers literacy and tutoring programs based on the research and writings of L. Ron Hubbard. The Center is part of a network of over 1,000 Applied Scholastics groups and affiliates worldwide utilizing L. Ron Hubbard’s Study Technology. More than 100,000 educators utilize these programs to the end of helping some 36 million students around the world. Applied Scholastics was founded in 1972 by a group of educators looking to implement successful educational methods. 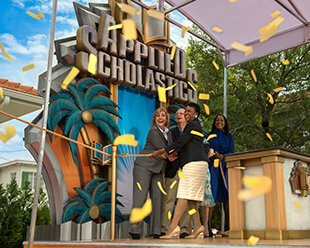 Applied Scholastics is administered by the Association for Better Living and Education. For more information, please go to AppliedScholastics.org. The new Narconon Suncoast, just 10 minutes from downtown, part of a growing roster of centers using the remarkable drug rehab technology developed by L. Ron Hubbard. The center stands as a valuable asset for residents in the Greater Tampa Bay community. The Criminon Florida headquarters, a central point for carrying out the mission of addressing the causes of criminality and restoring offenders’ self-respect through effective character-building programs. Currently over 1,000 prisoners in Florida are enrolled on Criminon programs, improving their chances of re-integrating into society as productive citizens. A center dedicated to The Way to Happiness, the nonreligious moral code written by L. Ron Hubbard. The new Clearwater office provides common-sense morality to communities throughout Tampa Bay. In one Pinellas County community alone, since volunteers began a campaign to educate residents with The Way to Happiness, the crime rate dropped 56%. The new center for the Foundation for a Drug-Free World, whose international The Truth About Drugs program has reached 260 million people worldwide. The Foundation has created partnerships with dozens of law enforcement agencies and more than 100 youth education facilities around Florida. A Clearwater home for United for Human Rights and Youth for Human Rights—global education initiatives working to identify and protect the rights of every citizen of the world. This headquarters has partnered with 130 like-minded groups and organizations to bring effective education on human rights to young and old alike throughout the State of Florida. A museum and operations center for Citizens Commission on Human Rights, the world’s leading mental health watchdog group since 1969. The Clearwater information center features the Psychiatry: An Industry of Death museum, and serves as an investigative arm and referral center dedicated to the eradication of psychiatric abuse.